1 - 11 $56.90 ea. 12+ $55.00 ea. GE 15482 - Q20A/PAR56/C - 300w - Elevated Approach Lamp - Airport Lighting - Description: This is a airport lighting halogen lamp 20 Amper - 300 watt Par 56 with medium flood lens and mogul end prong connections. This bulb is FAA approved and OAL is 5" and OD is 7". Life is 500 hours. Nominal light output is 38000 at center.This Par 56 is shatter shield coated. 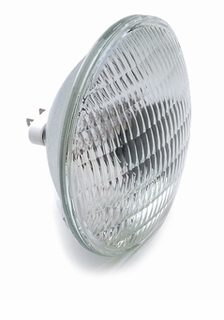 Data sheet: Q20A 300W PAR56 C Elevated Approach Lamp.